If you look for a 3 pieces paddle super cheap and with a good quality, this could be your choice, the Fanatic Pure is a very good option and it's one of the best entry level paddles of the market, with a 15% carbon shaft. The Fanatic SUP Pure 3 Pieces Adjustable paddle is the new one in the paddle range by the Austrian brand. With the Pure adjustable and the option to divide it in three parts, it is a good option like first paddle, without renouncing to good quality and you can put into the backpack and carry it wherever you want with your iSUP board, and it has low price. It is made in alu with a 15% of carbon, and it is adjustable from 165 to 220 cm, so it is perfect to adapt its length to the mostly of the riders and to the water conditions. The blade of the Fanatic SUP Pure Adjustable is made in ABS with a the standard size by Fanatic of 8" for the basic paddles line. It's lighter than the others paddles made in alu 100% so you can manage it easier. 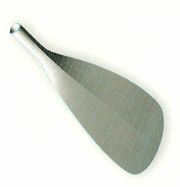 An all-rounded paddle for different SUP modalities.